A foreign national who is about to engage in a gainful employment in the Philippines is required by the government to get an Alien Employment Permit. This is an official document issued by the Department of Labor and Employment (DOLE) that authorizes, but not an exclusive authority, a foreigner to work in country given that no locals are able and willing to do the work reserved for the foreigner. With an Alien Employment Permit and a Working Visa like the Pre-Arranged Employment Visa, a foreign national may work on a long-term basis in the country. The initial validity of this permit is 1 year and can be extended for up to 3 years. Go to the Regional Office of the Department of Labor and Employment (DOLE) where the hiring company is under its jurisdiction. Submit your duly accomplished and notarized application form along with the required documents. Pay for the corresponding fees. You documents shall be evaluated and your name, position, employer’s name and additional relevant details shall be published in a newspaper. After the approval of your application, you shall then be issued an Alien Employment Permit. 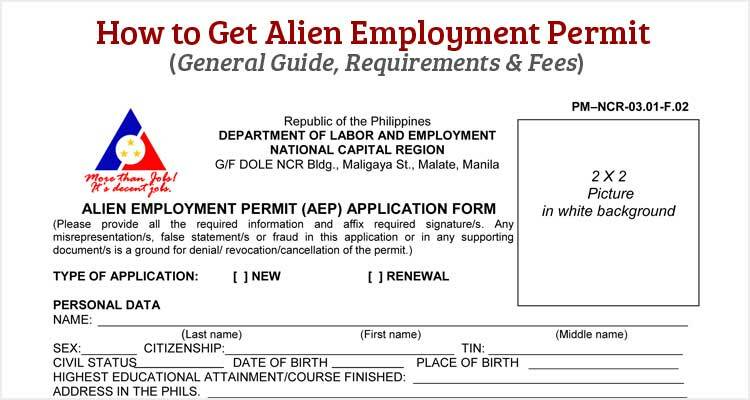 The application fee for an Alien Employment Permit is ₱9,000 with the validity of one (1) year. If the period of employment is more than one (1) year, there shall be an addition of ₱4,000 charge for every additional year or fraction of a year. For renewal, the charge shall be ₱4,000 for every year. Foreign nationals who are working in the Philippines without an Alien Employment Permit shall pay a penalty charge of ₱10,000. Furthermore, employers who are found employing foreign nationals without a valid AEP shall also be charged ₱10,000. This penalty charge is per year or fraction of a year. That was the general guide on how to get an Alien Employment Permit including the requirements, fees, and penalty charges. Have you successfully acquired your AEP? Do share with us some tips using the comment section.